2014 marks the 20th year since the open-air Maxwell Street Market was closed at its historic site on Maxwell Street in 1994 for the UIC/University Village redevelopment. 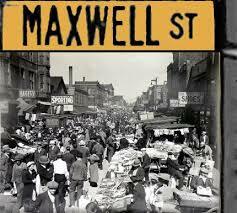 Today, the world-famous Maxwell Street Market which was created by city ordinance in 1912, operates on DesPlaines Ave. extending north from Roosevelt Rd. every Sunday year-round, from 7 a.m. – 3 p.m.
Come hear and see wonderful commentary and slides of what the Maxwell Street Market use to be like. Sunday, December 7 at 3:30 p.m.
← Here’s a peek at Christmas on the Air. Go see it!